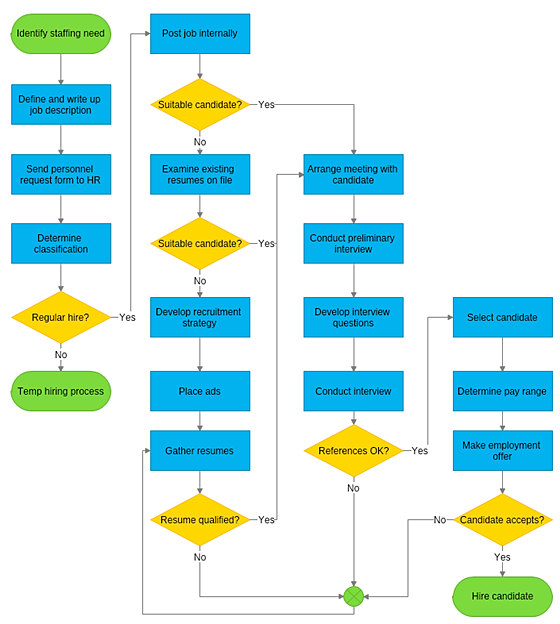 One of the easiest ways to document work instructions or show an ISO 9001 process flow is through the use of flowcharts and workflow diagrams. MyDraw is our preferred flowchart software because it is easy to use, feature-rich, compatible with Microsoft Visio and inexpensive. It's also ideal for similar applications including organizational charts, data flow diagrams, and cause and effect diagrams. Available for Windows and Mac. MyDraw is exceptionally intuitive and easy to use. No matter if you start with one of the many included templates or you create your flowchart or diagram from scratch, it's easy to get started. Just drag and drop the shapes, connect them with the click of a button and use the automatic layout feature to perfectly position all shapes even in complex flowcharts. MyDraw includes all the features you need to create ISO 9001 flowcharts and organizational charts, as well as many other diagrams. Features range from design features to productivity features and publishing and sharing features. MyDraw is the ideal alternative to Microsoft Visio. It's fully compatible so that you can import, edit and export Visio files like the ones used in our ISO 9001 Quality Management Manual. MyDraw is also less expensive and MyDraw is also available for Mac. By purchasing MyDraw you receive a perpetual license and a free upgrade to the next paid upgrade version. There are no monthly subscription payments as with most other flowchart applications. The MyDraw software is ideal for any flowcharting and diagram needs. It can be used with the flowcharts and diagrams included with our products, as well as for any other needs. Note sure if you will like it? Why not try the free 30-day trial version of MyDraw? Note: 9001Simplified is an Authorized Nevron Reseller for Nevron's MyDraw software. Nevron's Terms and Conditions of Sale apply. 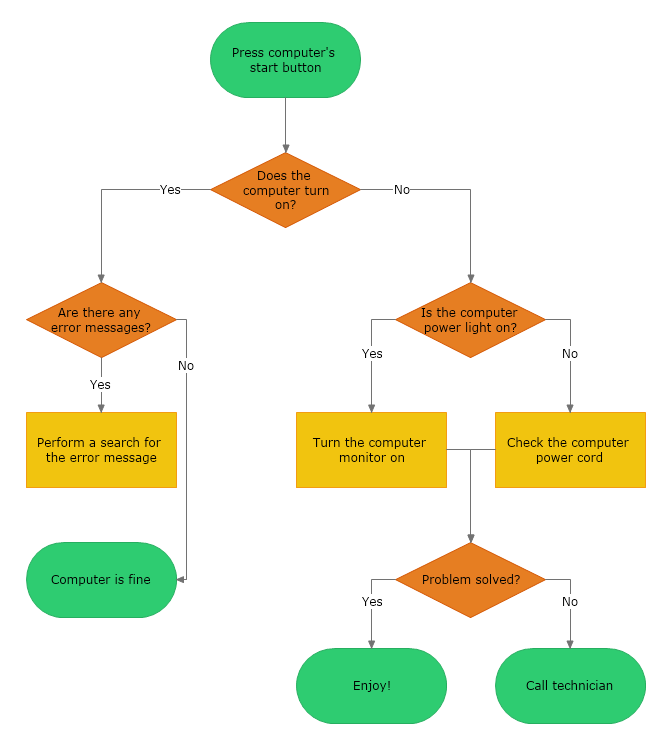 The MyDraw flowchart program has many features that are particularly useful for ISO 9001 compliance. Starting with MyDraw is as easy as it could possibly be. MyDraw is optimized it to match the familiar MS Office interface which you're already familiar with and thus minimize the learning curve. You can even switch between several themes to match the look and feel of your operating system in both Windows and Mac. MyDraw is fully compatible with Microsoft Visio. You can use MyDraw to import, edit and export Visio flowchart files like the ones used in our ISO 9001 templates and forms. MyDraw includes many ready-to-use templates for ISO 9001 flowcharts and organizational charts, as well as templates for flyers, certificates & business cards, and various diagram types. You can easily get started by editing existing diagram templates or by making your own one. MyDraw includes not only the basic flowchart shapes but many more shapes and images, all of which you can directly drag and drop into your drawings. You can even create your own custom shapes, arrange them in libraries and reuse them within your diagrams. MyDraw comes with a large set of drawing tools which help you easily create any shape you need and style it to match your company's corporate identity or your personal demands. You can also combine simple shapes into groups and create advanced complex shapes. Save them in your own library for future reuse and edit them at any time. MyDraw comes with an automatic layout function to help you quickly arrange your flowcharts. Simply create your flowchart without spending additional time on aligning shapes and once you're done - go to the Arrange tab -> Layout Shapes button and automatically arrange your diagram. There are many options, allowing you to customize the layout to your specific requirements. With MyDraw you can export your diagrams to images and vector files in just a few clicks. This allows for easy insertion into your ISO 9001 documentation, as well as for other applications (for example, you can even choose to export your images with high resolution, creating pictures which can be printed even on billboards). Another great feature for ISO 9001 document control purposes is the ability to specify each shape's permissions and make it unprintable - this will allow you to have shapes which serve simply the purpose of comment boxes or carry information which is not relevant to the printed version of your diagram. MyDraw includes a spell checker with English (United States), Bulgarian (Bulgaria), German (Germany), Spanish (Spain), French (France), Portuguese (Portugal), and Russian (Russia) dictionaries. You can load additional proofing languages. With MyDraw you can insert barcodes in your ISO 9001 flowcharts and diagrams. This allows you to include additional information for those users that have a barcode reader. Possible uses include work instructions that include links to open up related applications. You can switch the user interface of MyDraw to a preferred language. Currently, supported languages include: English, Spanish, German, Portuguese, Chinese, Bulgarian, and Russian. MyDraw comes with built-in mail merge functionality. 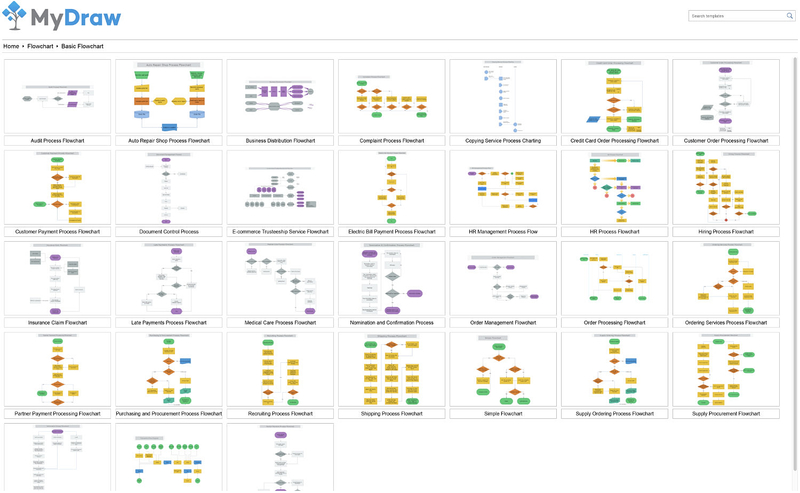 Bookmarks will come in handy when working with large and complex flowcharts. The bookmark feature allows you to quickly get to one or more parts of your flowchart. MyDraw lets you easily make presentations by switching to presentation mode where you will see your drawing in full screen. MyDraw is available for Windows and Mac. MyDraw offers the same identical user experience under Windows and Mac OS X so that you can start using it on Windows and continue on Mac (or vice versa) and nothing will change. You can download the installation instructions in PDF format from the following link: MyDraw Installation Instructions. The samples below will help you evaluate the MyDraw flowcharting software and its features. much easier to use than visio, much cheaper too. We invite customers who have purchased this product to submit a review, detailing their thoughts and impressions. Reviews should be at reasonably detailed and offer information that will be helpful to others.